This guide contains information about discounts and services for eligible households in Victoria. 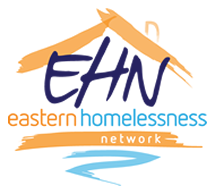 The State-wide Homelessness Networks were established in 1996. They operate across Victoria in every Department of Health Human Services (DHHS) region and are funded DHHS to bring services together to share information, and identify common needs and gaps in homelessness service provision. The Brokerage administered by the Statewide Children’s Resource Program has been refunded for the 2018-2019 financial year. Applications are now open. In 2012, the Victorian Government initiated an inquiry into the handling of child abuse allegations within religious and other non-government organisations. The Betrayal of Trust Report, which detailed the inquiry findings, made a range of recommendations, including the need to better protect children from child abuse when they access services provided by organisations. Child Safe Standards and the Reportable Conduct Scheme are part of the Victorian Government’s commitment to implementing these recommendations. Family Access Network in conjunction with Anchor coordinate the Private Rental Brokerage Program, assisting young people who are ready to live independently in a share-house or private tenancy. With the National Disability Insurance Scheme already rolling out in the Inner and Outer East, we have been gathering information that will be useful to those practitioners working within the homelessness sector. Family Access network (FAN) has SSATI HEF available for young people (15-25) who identify as sexual or gender diverse who are at risk of or are experiencing homelessness. Mind works with people 16 - 64 years of age whose ability to manage their daily activities and to live in the community is impacted by mental health issues. People who use our services come from many cultural and socioeconomic backgrounds. Domestic Violence Resource Centre (DVRC) Referral Options booklet has been developed as a resource for workers in the domestic and family violence sector. It includes contact details and further information on services in the family violence and related sectors around Victoria. The Council to Homeless Persons (CHP) is the peak body representing organisations and individuals in Victoria with a commitment to ending homelessness. Information and tip sheets to help workers navigate the Access and Eligibility for Financial Support for New Zealand migrants living in Australia. The Disability and Family Violence Crisis Response initiative aims to assist Victorian women (and their children) with a disability who are experiencing family violence. The phenomena of fatal distraction occurs where a parent or carer inadvertently leaves their child in their car due to short-term memory failure caused by extreme exhaustion, stress or a change in routine. This can possibly lead to severe injury or in extreme cases the death of a child. Starlady from Zoe Belle Youth Project spoke to our EHN Practitioners forum in August about the free trans and gender diverse inclusive practice training. Below are some fantastic resources to assist you and your organisation develop inclusive practice. The YHAG has been active in the Eastern Metropolitan Region (EMR) for a number of years and is now run under the umbrella of Creating Connections. This resource has been created by the Statewide Children's Resource Program to support the Specialist Homelessness Services of Victoria to ensure children are being recorded correctly. Published by Our Watch, this free, downloadable poster aims to harness the power of bystanders by providing 26 practical actions to challenge gender stereotypes and promote respect. Prepared by the Statewide Children's Resource Program, this fact sheet provides useful information about the numbers of children presenting and the expenditure of the Homeless Children's Brokerage Program. The safety and wellbeing of children is a shared responsibility. Homelessness services are often in contact with the most vulnerable children and families in our community, and can help enhance their safety and wellbeing. The RDNS Homeless Persons’ Program (HPP) involves a team of specialist community health nurses who work with and on behalf of individuals and groups currently experiencing homelessness. Flexible Support Packages (FSPs) that target high risk and promote safety have been introduced by Department of Health and Human Services (DHHS) to recognise family violence (FV) and the impacts on the health and wellbeing of women and children. 2016 guide for children and families seeking financial assistance. A core function of the Statewide Children’s Resource Program is to develop resources for children who are experiencing homelessness and family violence. 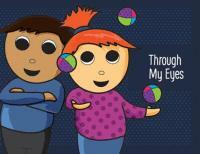 The Benevolent Society and The Parenting Research Centre have produced these Practice guides for working with children. Alcohol use during pregnancy is linked to a spectrum of adverse fetal outcomes. This spectrum of abnormalities is collectively termed fetal alcohol spectrum disorders (FASD), and can include physical, cognitive and developmental symptoms. Choosing Positive Paths is a resource kit offering information to mothers, other protective parents and/or carers on what to expect from and how to respond to children, at all ages and stages, who have experienced family violence. Children are different and each develops at their own rate. For some children and adolescents the trauma and stress of being homeless or experiencing family violence can affect their development. Being a parent is hard work and becomes even more difficult when your family experiences stressful times. Information on back to school costs and financial assistance available to families. Australian Human Rights Commission Poster. Contact list for the Statewide Children's Resource Program members across Victoria. Please consult this list if you would like information about programs for children in different areas or would like to source links for a family moving out of the eastern metro area. 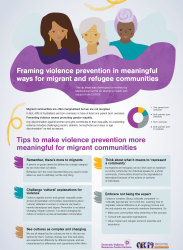 This resource regarding family violence has been developed for adults (including early childhood educators) who work with children and young people. The Nursery Equipment Program has been established to provide safe nursery equipment for vulnerable Victorian families where a safety concern has been identified by a maternal and child health nurse on the MCH Safe Sleeping Checklist. This booklet, produced by the Statewide Children's Resource Program, may assist you to help a child through their experiences of family violence and/or homelessness. It contains children's stories in their own words and pcitures. The Victorian Commission for Children and Young People is an independent statutory body established to promote improvement and innovation in policies and practices affecting the safety and wellbeing of Victorian children and young people. We have a particular focus on vulnerable children and young people as defined in the Commission for Children and Young People Act (2012). In April 2012, the Victorian Government initiated a landmark inquiry into the handling of child abuse allegations within religious and other non-government organisations. All practitioners in all services are expected to be familiar with these changes. An offence for failure to disclose child sexual abuse came into force on 27 October 2014. This offence has been introduced as part of the Crimes Amendment (Protection of Children) Act 2014, in response to a recommendation from the report of the Victorian Parliamentary Inquiry into the Handling of Child Abuse by Religious and Other Non-Government Organisations, Betrayal of Trust. This document provides general guidance for the implementation of the child safe standards to improve the way organisations that provide services for children prevent and respond to child abuse that may occur within their organisation. Victims of family violence can now access support packages to assist with financial and practical support needs in order to leave abusive relationships or heal after leaving one. EWOV is a not-for-profit, independent and impartial dispute resolution service. We provide Victorian energy and water customers with free, accessible, informal and fast dispute resolution. A program to support women aged over 50 who are homeless or at risk of being homeless. K.Y.M. 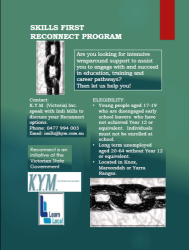 (Victoria) Inc is running a Program available to 17-64 year olds, supporting them to reengage into education, training and/or employment. Presented by Uniting Care ReGen, The Family Methamphetamine First Aid program has been designed specifically for family members concerned or affected by a loved one’s use of methamphetamine (Ice). This program has been developed collaboratively with people who have a lived experience of the impacts of methamphetamine use on individual and family members’ wellbeing.